No currency symbol is more famous than that of the dollar ($), and no banknotes are more iconic than the green dollar bills. There are seven denominations of dollar bills ($1, $2, $5, $10, $20, $50 and $100), and each has, on its front, the portrait of an important American. The seven lucky ones include five US presidents and two Founding Fathers, the people who helped found the United States of America. They are all men, though, and somebody thought this was not right. In 2014 Sofia, a 9-year-old girl from Massachusetts, wrote a letter to President Obama saying that women too deserved to be on the front of a dollar bill. Obama answered that this was ‘a pretty good idea.’ To make space for a woman, a president or a Founding Father had to go. Jack Lew, Secretary of the Department of the Treasury (which prints US dollars), suggested removing Founding Father Alexander Hamilton (1755-1804) from the $10 bill. Lots of people protested. Among them was Lin-Manuel Miranda, the author of the incredibly successful Broadway musical Hamilton. Hamilton, which premiered in 2015, tells the story of the Founding Father in a very original way, using hip-hop music and a multi-cultural cast. Lew went to see the musical and loved it. He later met with Miranda who asked him to ‘save’ Hamilton. Like so many Americans, Hamilton was a poor immigrant. With courage and determination he fought for American independence. He lived an adventurous life and was killed in a pistol duel. Most importantly, he helped create the Department of the Treasury and was its first Secretary. If it wasn’t for Hamilton, there probably would be no such thing as the dollar! He had to stay! Lew reconsidered. He suggested keeping Hamilton on the front of the $10 bill and putting images of the women’s movement on the back. Again lots of people protested, especially women. They claimed that what matters is who’s on the front of dollar bills, not on the back! It seemed impossible to find a solution that made everybody happy. Yet a popular movement called Women on 20 had a suggestion: an American woman could go on the front of the $20 bill, replacing the controversial president Andrew Jackson (1767-1845). Jackson was a slave owner who opposed the abolitionist movement that wanted to end slavery. He also forced native Americans to leave their lands so he could give it to white settlers. This relocation, later called the ‘Trail of Tears’, caused the deaths of thousands of native Americans. Jackson had to go! On April 20, 2016, Lew declared his final decision. Hamilton is safe: he will remain on the front of the $10 bill. The back of the same bill will show leaders of the movement to give women the right to vote. Finally, a woman will replace Andrew Jackson on the front of the $20 bill. The woman chosen will not only be the first woman to appear on the front of a dollar bill, but she will also be the first African American person to do so. 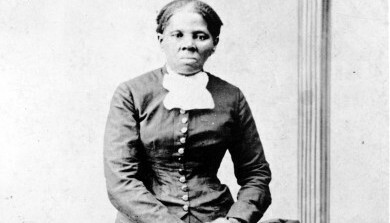 Her name is Harriet Tubman (1822-1913). She was born a slave, but escaped to freedom. She helped many other slaves escape, and she became a leading abolitionist. During the American Civil War she worked as a nurse and even as a spy! After the war she fought for the rights of women to vote. Everybody praised Lew’s choices. Not everybody was happy with his schedule, though. The new bills will be released no sooner than 2020! the least famous symbol for money in the world. one of the most famous symbols for money in the world. important men from American history. is the first Secretary of the department of the Treasury. is the author of the Broadway musical Hamilton. is the current Secretary of the department of the Treasury. was born in the United States. was not born in the United States. died in a pistol duel. the women’s movement on the $10 bill. Jackson off the $20 bill. Jackson on the $29 bill. convinced Lew that Hamilton had to go. had no influence on Lew’s decisions. helped many slaves become free. Was against the abolitionist movement. a. only to the $10 bill. b. only to the $20 bill. c. to the $10 and the $20 bills. 1. A person who wanted to end slavery was called an _______________. 2. A person is born, a nation is _______________. 3. To _______________ something means to say that something is true. 4. Money usually comes in the form of metal coins and paper _______________. 5. A ______________ was a fight between two people, usually fought using swords or guns. 6. A ______________ is like a discussion, but it is often public and focuses on a specific topic. 7. After a long journey, the ______________ found a piece of land where they could build their new house. 8. Important people of the past had their _____________ painted by famous artists. 10. A _____________ is the value of a particular coin or bill. 3) Rewrite the sentences using reported speech. e.g. Sara said (that) women should feature on money as well. [post_excerpt] => The US dollar bills will soon undergo an important restyling, the outcome of a long and heated national debate. Read how a 9-year-old girl, a Broadway musical and the women’s movement helped shape the history of the world’s most famous currency. [post_excerpt] => Driverless lorries will be tested on UK roads this year, and in 2020 we will be able to buy a self-driving car. Technology is changing our lives, often in unpredictable ways. 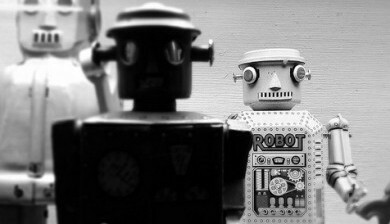 Some experts say that our inventions will destroy us, others that they will make us more than human. Read about the incredible scenarios awaiting us. On the night of February 28, 2016, after five previous nominations and zero wins, Leonardo DiCaprio finally won his first Oscar. “At last!” must have thought his fans around the world. Something similar happened to another amazing artist: Italian composer Ennio Morricone. He received an Honorary Oscar in 2007, but he won his first Oscar for Best Original Score this year, after five previous nominations and zero wins. An Oscar is a very prestigious award. Most people in the cinema industry would love to win an Oscar. That’s why Leo’s friend Kate Winslet keeps hers in the bathroom: her guests who go for a pee can pose with it in front of the mirror, and, for a couple of minutes, they can pretend to be winners. Besides the prestige, films that win an Oscar make more money. Actors and actresses who win an Oscar earn more money. An Oscar even has ‘health benefits’: a study shows that people who win an Oscar live longer than those who don’t. Apparently, Oscars even make chickens lay larger eggs! That’s what actor Russell Crowe said after putting his Oscar in his chicken coop. The official name of an Oscar is ‘Academy Award of Merit’. The winners are decided by the members of the Academy of Motion Picture Arts and Sciences. The award is a little golden statuette of a knight holding a large sword. It was designed in 1928 by Cedric Gibbons, a Hollywood production designer. No human model was used to design the statuette. Nobody really knows how the statuette got the nickname ‘Oscar’. According to a popular story, an Academy librarian said that the statuette looked like her uncle Oscar. Many professions in the movie industry receive the award: actors, writers, directors, producers, and technicians. Curiously, the production designer who designed the statuette, Cedric Gibbons, won 11 of them. To be nominated for an Oscar, a film has to be shown for at least 7 consecutive days in the Los Angeles county cinemas. This means that even a foreign film, in a foreign language, can be nominated. The Italian La vita è bella is an example. It was shown for several weeks in Los Angeles, and it was nominated for Best Picture. The protagonist of the film, Roberto Benigni, won the Oscar for Best Actor. The awards are given during a very important ceremony. All the nominees hope to hear their name at the end of the sentence “And the Oscar goes to…” (Before 1989 the phrase used was the even more famous “And the winner is…”). The winner collects the award and can give a brief speech. But it has to be very brief indeed. It can only last 45 seconds. When the 45 seconds are over, the orchestra starts playing even if the winner is still talking! Are you interested in Academy Award records? Can you find any Italian who holds a record? in front of her mirror. keep the award in a funny place. earn less money but live longer. the official name of the Academy Award. the name of the model used to design the award. shown in Los Angeles cinemas. holds the record for most Oscar wins. designed the statuette and called it Oscar. won many times the Oscar he designed. give a very long speech. give a very brief speech. more Oscars than Meryl Streep. less Oscars than Alfred Hitchcock. an Oscar for the X-Men films. won more Oscars than any other actress. was very young when she won an Oscar. has been criticized only once. has been criticized more than once. 1. A _________________ is a person who receives a nomination for an award. 2. A _________________ is the typical weapon of a knight. 3. In a _________________ you can probably find many eggs. 4. A _________________ is a small statue. 5. Something that has _________________ has a very good reputation. 6. _________________ is another word for ‘film’. 7. A _________________ is a person who directs the filming process of a film. 8. If you are talking in front of many people, you are probably giving a _________________. 9. A _________________ language is a language spoken outside one’s country. 10. To _________________ somebody, means to get him or her to join something like a group or an association. 3) Complete the sentences with the correct past tense of the verb. 1. Kate Winslet ________ (put) her Oscar in her bathroom. 2. An Academy librarian ________ (think) that the award looked like her uncle Oscar. 3. Animator and director John Lasseter ________ (put) Barbie clothes on his Oscars. 4. A sculptor ________  (make) the Oscar statuette using Cedric Gibbons’ design. 5. 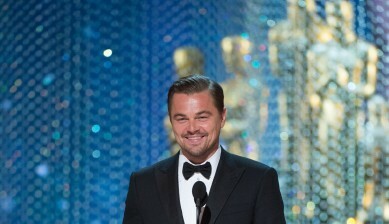 Leonardo DiCaprio ________  (get) his first Oscar in 2016. 6. The actress was very happy when she ________ (hear) that she had won an Oscar. 7. It was actress Sofia Loren who ________  (give) the Oscar to Roberto Benigni. 8. Russell Crowe  ________  (win) an Oscar for his role in the film Gladiator. 9. In 2015, the Academy ________ (choose) only white nominees for the acting awards. 10. In 2000 two men ________ (steal) 55 Oscar statuettes and ________ (hide) them. A man called Mr. Fullgear ________ (find) them and called the police. [post_excerpt] => Every year, the Academy Awards is the biggest event of American cinema, and the Oscar statuette is probably the most famous film award in the world. Find out some of the more curious facts about the Oscars, and read about some of the criticism the Academy has received. [post_content] => “First ever flower grown in space makes its debut!” tweeted astronaut Scott Kelly on January 16, sharing the photo of a zinnia flower. 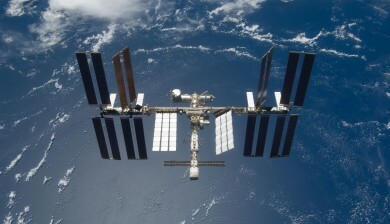 The tweet was sent from the International Space Station (ISS), orbiting at 250 miles (400 km) above the Earth’s surface. The experiment, an attempt to grow zinnia in space, began in November. It was a very difficult experiment. The astronauts of the ISS had to learn how to garden, and we’re not talking about normal gardening, but gardening in space! How do you water a plant in a microgravity where water does not flow but floats? And how do you grow a plant using only artificial lighting? The astronauts followed the instructions they received from a NASA ‘Veggie team’ back on Earth. The zinnia was grown aeroponically, meaning in a very humid environment without soil. A fan was used to regulate the humidity. Red, blue and green LED lights were used to simulate sunlight. But it wasn’t enough. Around Christmas, the zinnia plants looked like they were going to die. Every few months, food supplies are sent to the ISS from Earth. This won’t be possible on longer-distance space voyages. If astronauts go to Mars, for example, they will have to be self-sufficient: they will have to grow their own food. NASA is planning to return to the Moon in the 2020s. A mission to Mars might take place in the 2030s. If you would ever like to go on such adventurous trips you could start by going to one of NASA's 'space camps'. There you can learn how to become an astronaut. Space camps include space simulations and space exploration activities. You also get to meet and talk to real astronauts. If you want to go to Mars, though, be warned: the first mission to Mars might be a one-way ticket. This means that the astronauts might have to live and survive on Mars without the possibility of returning to Earth. So, if you want to go, you will have to know how to grow your own food! Like the ISS, the first trip to Mars will probably be an international enterprise. NASA collaborates with many other space agencies (including the Italian ASI). Together, they developed the Global Exploration Roadmap (GER). This project coordinates efforts to explore destinations, such as the Moon and Mars, where people will someday live and work. In the meantime, space exploration has already changed the way we live and work here on Earth. Have you ever used ear thermometers, cordless devices, water filters, scratch-resistant lenses, athletic shoes, satellite TV, or portable computers? Have you ever slept on a foam mattress? Then you have used products that were developed or improved by NASA for its space missions. NASA has helped develop more than 2,000 spinoff products. Even if you're never going to travel to outer space, there's already a bit of outer space in your life! Have you ever reflected on our place in the universe? Read about the 'Pale Blue Dot' picture and Carl Sagan's thoughts about it. Discuss it with your class. [post_excerpt] => “The future of humanity awaits in deep space,” said the chief of NASA Charles Bolden. Space exploration is a highly ambitious enterprise. It promotes international cooperation, and it produces thousands of inventions. But it is also about simple things, like growing a flower. Look around you: how much of what you see is the product of humans? You might see streets, buildings, factories, farms and crop fields where there once flourished natural environments. According to many studies, humans have transformed 50% of the Earth's land surface! We have caused the extinction of many species and ruined many habitats. When we burn fossil fuels, such as coal, oil and gas, we produce dangerous greenhouse gases (for example CO2) that cause the Earth's temperature to rise. This planetary "fever" or "global warming" is causing disasters such as droughts, tornadoes, floods and the melting of the polar ice caps. Most scientists say the situation is critical. Even Pope Francis wrote an encyclical (a special papal letter) called Laudato Sí – On Care For Our Common Home urging action against climate change. But what are the governments of the world doing about it? Thousands of people demonstrated around the world calling the Agreement "weak". They pointed out that parts of the Agreement are “promises” and not commitments. Some important issues were left out, such as livestock agriculture that, according to the UN itself, produces more greenhouse gases than all cars, trains, planes and boats combined! Also, the Agreement is not yet law for its member states. Each state has to approve it first – probably some never will. But even if all goes well, many scientists say that the Agreement is not enough to contain global warming. Do we really have to wait for governments to solve this problem? The answer is no. Many environmental associations are already fighting climate change. There are businessmen investing in new, green technologies for a cleaner future. There are millions of ecologically conscious people, adults and children, doing their part. That´s because we all have an "environmental footprint" (meaning an impact on the environment) and we can all do something to reduce it by acting, for example, on how we eat, live, travel. A "climatarian" diet consumes foods that have a low impact on the environment. An energy-efficient home saves on heating and electricity using good insulation, LED lights and maybe solar panels. Walking and biking are ecological alternatives to taking the car. And if you feel that you want to do more, when you're older, you can choose a "green career", a job that helps solve climate change problems. So, what are you doing to help save the planet? 2. The planet's "fever" is called ______. 3. One of the main problems of the Earth's/Earths climate is global warming. 4. To burn/Burning fossil fuels produces greenhouse gases. 10. It's time to take/taking action to solve global warming. [post_excerpt] => Droughts, tornadoes, floods, melting polar ice caps – climate change is causing disasters around the world. 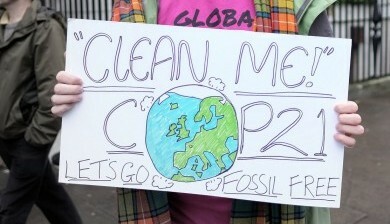 The representatives of almost 200 nations met in Paris to find a solution to this dramatic problem. What did they decide and what can you do to help save the environment? Driverless lorries will be tested on UK roads this year, and in 2020 we will be able to buy a self-driving car. Technology is changing our lives, often in unpredictable ways. Some experts say that our inventions will destroy us, others that they will make us more than human. Read about the incredible scenarios awaiting us. Droughts, tornadoes, floods, melting polar ice caps – climate change is causing disasters around the world. The representatives of almost 200 nations met in Paris to find a solution to this dramatic problem. What did they decide and what can you do to help save the environment?